This post is not sponsored and all opinions are strictly my own. Please consult with a pediatrician if you have any specific questions related to introducing solids or allergen prone foods. Introducing solids can be somewhat stressful (when, how much, which foods, etc.) and to add to that as a new parent you are always thinking about potential allergies and food sensitivities. 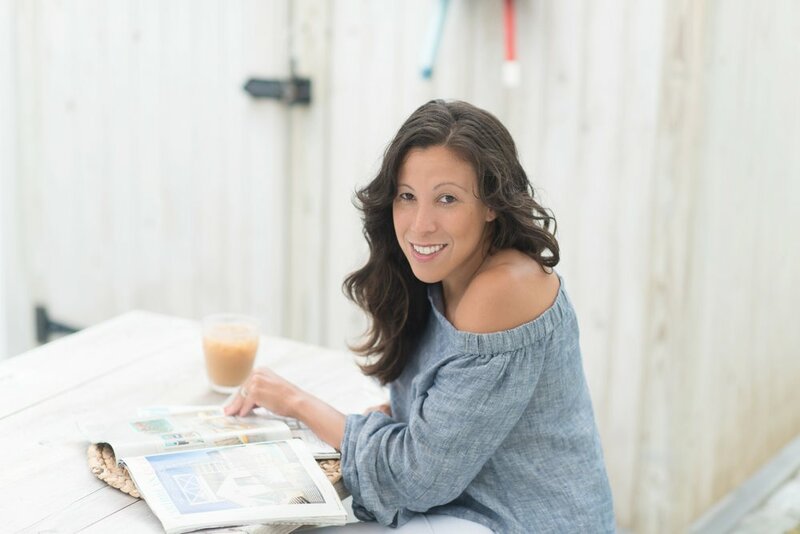 I followed the guidance and advice of our pediatrician and she advised us to introduce a variety of foods in the early months, including eggs, peanut butter and tree nuts. With my first, we introduced him to nuts early (6 months) and followed with baked eggs and other allergy prone foods shortly after. With our second, we've taken a similar approach, but we've been better about the introduction of more allergen prone foods earlier and more consistently. Inspired Start is truly a gamechanger for our family. They make it easier for parents to approach introducing allergens (e.g. peanuts, tree nuts, soy, shrimp, eggs and more). As the only baby food designed for early allergen introduction, it has helped me approach the introduction of different foods more frequently (takes the guess work out too!). 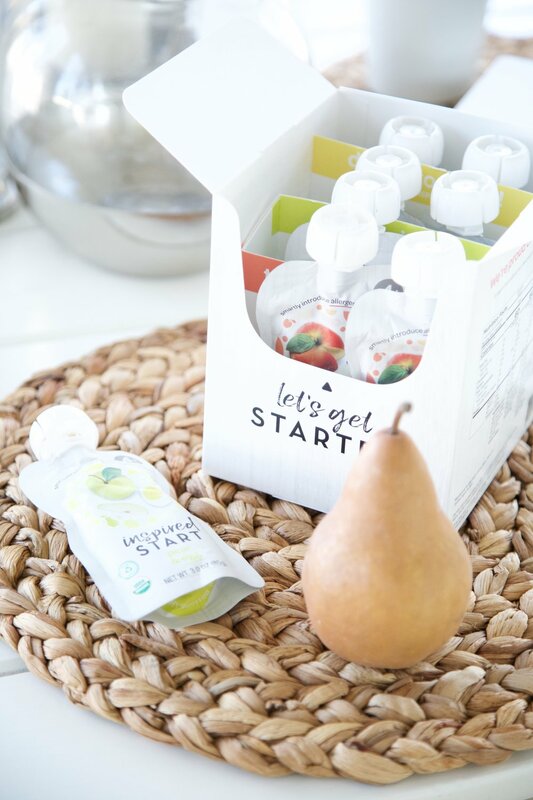 The combinations are great, yummy (yes, I tried the pear & egg and was pleasantly surprised) and packaged in a pouch which makes it so easy for us to bring on the go or pack up for daycare. I also always read labels and the ingredients are simple, organic and limited to a combination of two items (i.e. pear + egg, apple + peanut butter, mango + soy, banana + tree nuts). We started with pack one and I've just purchased pack two to introduce him to wheat, sesame, shrimp, and cod (tip: I added it to my Subscribe & Save monthly Amazon subscription, which means we will always be stocked). Baby Harrison loves every flavor combination and you can tell by his excitement that he's a big fan as well. I cherish these early milestones and it's even better with a big brother who is very curious. My oldest loves to point out when baby likes something and he is quick to comment "baby likes it, baby likes it", which adds to the fun. 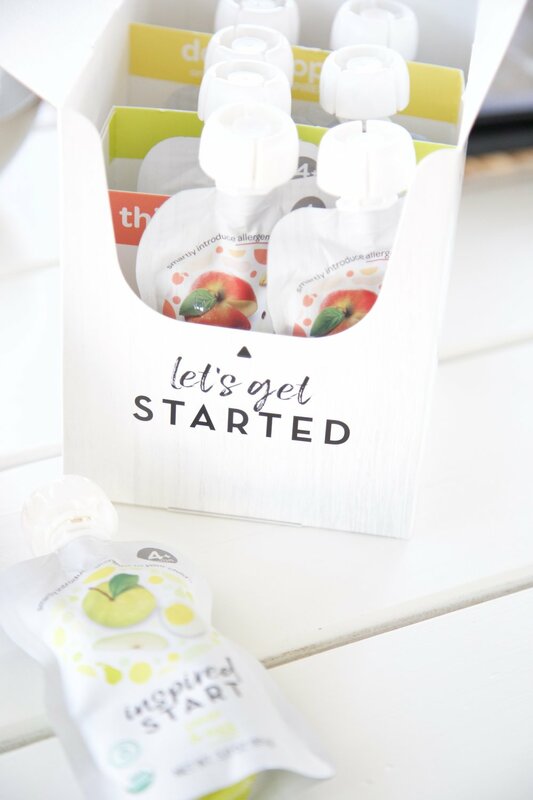 I am so excited to share my love of Inspired Start with you and I'm partnering with the brand to giveaway one box of the pack one. To enter, please follow @amodestlife and @inspiredstart on Instagram and tag a friend, or fellow momma, in the comments section on both accounts. The giveaway closes on Tuesday, January 16th (you must follow both accounts in order to win) and the winner will be announced on Wednesday, January 17th by 12 Noon EST. Good luck and happy tagging!